We offer the possibility to integrate CAESES® into other software packages, to run it in the background as a geometry engine for parametric surfaces in CFD applications. This adds a powerful CAD package to your CFD software, which provides simulation-ready CAD that is ideally suited for design explorations and shape optimization. 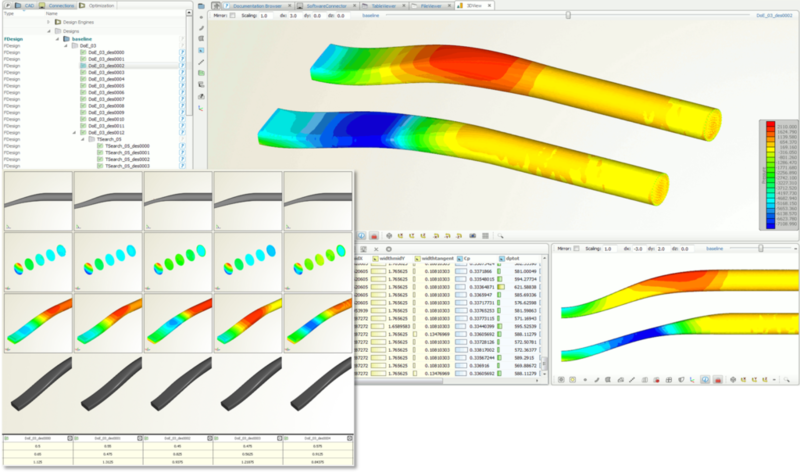 Robust variable geometry – directly available for your users within your CFD software product. CAESES® can be run in its silent batch mode where the geometry models are controlled by an ASCII script file. We are also open to other technical solutions, if needed. Your users will love the access to their robust variable geometries directly through your simulation package! CAESES® can also be used as a graphical user interface (GUI) to your CFD code (in-house/commercial/non-commercial). With this, you can immediately offer advanced surface creation methods, CFD automation, interactive post-processing and even embedded optimization strategies. We also offer a full rebranding of the CAESES® GUI according to your company brand (logo, colors). Examples for such an OEM solution are the various SHIPFLOW packages, for the hydrodynamic optimization of ship hull forms.